Four-wheeler market share in Batam increasingly significant. This was evident from the number of car brands that recently flooded the automobile market. This time people are given a choice again a top brand American dropout, namely Chevrolet. Chevrolet car dealership, PT Majesty Auto World re-introduced his tergress automotive products in the exhibition which was held for five days at the food street Nagoya Hill, since Wednesday (07/07/2010), up to five days ahead. "This exhibition is organized to provide information kepaada our society will be a superior product that is new Chevrolet car edition. 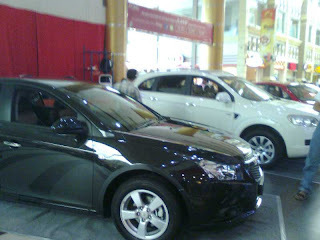 In this exhibition we show three variants yatiu Chevrolet Chevrolet Aveo, Chevrolet Optra and Chevrolet Captiva. All the latest products with advanced features inside. The first goal of this exhibition can provide inspiration for people who want to have a new car, especially the Chevrolet brand, "said Rusli, Operational Manager PT Majesty Auto World. It is said Rush, the exhibition which will last for five days, carried out in order to introduce sophisticated features embedded in each variant latest Chevrolet. "This car is very well suited to families, especially for large families because they have a lot of seats, ie seven seats," said Rusli. Glance do not look at the differences between the Chevrolet Captiva gasoline or diesel, both exterior and interior. However, you will find VCDi logo on the back and heard the snoring of a typical diesel engine when turned on. Captiva diesel is only available in automatic transmission model with a revenue stamp to Batam worth 390 million market. Meanwhile, starting from the official price of gasoline Captiva USD 306 million to $ 309.6 million, with manual or automatic transmission choices. SUV market in Indonesia, with a monocoque chassis, an apple-to-apple, Captiva actually compete with the Nissan X-Trail, Honda CR-V and Ford Escape. However, all of his opponent's absence with a diesel model. As a result, Captiva Diesel 'forced' to deal with the Toyota Fortuner diesel and Ford Everest that had ladder frame chassis. In addition, the capacity of a seven-seater Captiva is also commensurate with the Fortuner and Everest are also able to carry seven people. Captiva present to the public the first time in the form S3X concept at the Paris Motor Show 2004. It was not until two years later greeted in the form of the Chevrolet Captiva at the Geneva Motor Show. Overall, the interior Captiva is quite satisfactory. However, its dashboard design was simpler than the X-Trail or the CR-V. Cabin quality still needs to dingkatkan. While in the cockpit, the rider can get a dynamic composition of sitting. We can move the seat to the front-rear and top-down well, so getting a better vision.